Michelle Taylor is not who her new family in Lancaster County believes her to be. The Lapps were looking for their long-lost granddaughter when they met Michelle, and she assumed the identity of Sara Murray. Once homeless and hopeless, Michelle has come to love her new Amish friends and even considers the idea of romance among them. 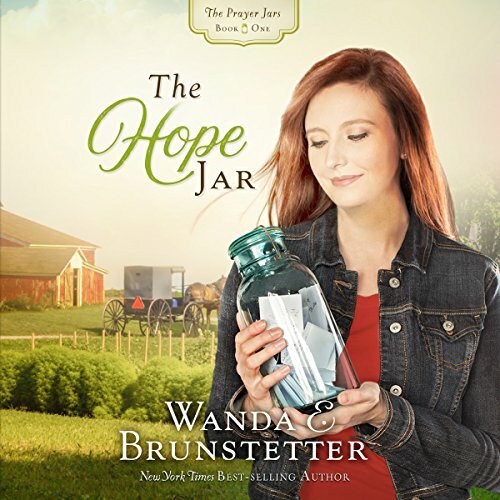 Finding an old blue jar in the barn that is filled with slips of paper containing thoughts, quotes, and prayers by an unknown author becomes a boost to Michelle’s budding faith - but also convicting. How can she tell the truth without hurting the ones she has truly come to love? The story line of this book was really good. I would recommend it to anyone. I have always loved the author she keeps the stories very interesting and I also like the narrator. This book was a little to long for me. I couldn't believe how cold hearted and selfish Michelle was. It seemed like the Laps liked Michelle better than Sarah. Sometimes these books have people falling in love to fast. Michelle seems like a horrible person! I get that she was desperate to get away from the boyfriend but deceiving two elderly people AND stealing from them in the end?? Awful!!! In the end it seemed she learned ALMOST nothing and took the cowardly way out. Ezekiel was pretty decent and annoyingly so, so was Brad. I was rooting for Ezekiel but he was kinda slow. Perfect guys for a horrible leading lady. Blegh, what else is new. Works like that in real life too so whatever. I rated the book positively cause I loved how the author described the Lapps and their HEARTS. I can't understand why was their daughter so...... (again) a terrible person! Seems to me like all the characters in the book(s) are just horrible people and punch of hypocrites. Except for the Lapps of course. They're the only characters in the book that made me wanna read the book and see how they react. Truly likeable characters! The ending was sort of a cliffhanger. I had to purchase second part cause I REALLY wanted to read what happened with the Lapps and real Sarah. Also how Michelle changed..... or did she? Anyways. If you're a calmer person then maybe this book is for you. If you're like me, you might wanna bunch Michelle and Sarah in the face time to time. Sorry for the possible mistakes I made writing here. English is my third language. Loved everything about this book! I had no idea how it would end! It is a story of hope. Great book! So nice to be read to. So nice to have audible books. with my busy life I don't have time to just sit down and read. This is the answer to my needs. I really enjoyed this book . It was great I wish I could find #2.I have always enjoyed all of her books.I have several. Love this book!! I couldn't stop listening! Can't wait for the second one to come out! The book is good with details but slow with story line events. Very good story!